I am happy and proud to present the outcome of several minutes of research by leaders in the field of military-grade cryptography (Matt, Paulo, and yours truly, as well as Samuel for the optimized code): Tweetcipher, a compact authenticated encryption algorithm, initiated through Twitter discussions. Our silly exercice of style was to create a cipher that would fit in the smallest number of tweets (each being at most 140 characters). Tweetcipher shamelessly borrows from two of the most important contributions in symmetric cryptography of the last 10 years (in my very subjective opinion): the sponge construction and the Salsa20 core. 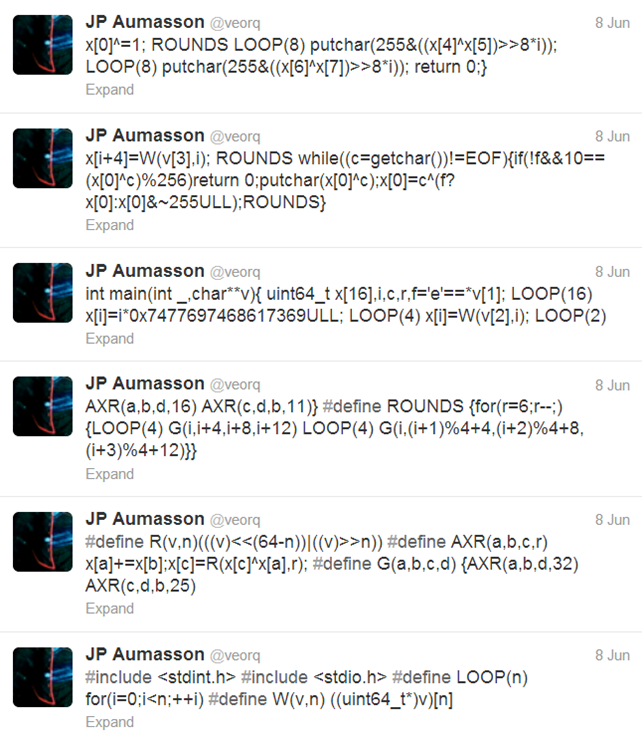 Tweetcipher is so simple that, like Bitcoin, it doesn’t need a specification document! The C program above can encrypt a message and produce an authentication tag for that message, and also decrypt and encrypted message (without verifying the tag). Now please, seriously, DO. NOT. USE. THIS. (unless maybe if it’s to replace ROT13+CRC). Tweetcipher is more a joke than a real cipher design, so please break it, we’d be happy to hear about it and to present your attack on this blog. Legal disclaimer: we hold no patent/copyright on Tweetcipher etc. etc. Previous Post: Cyber security: information security is dead, long live information security!